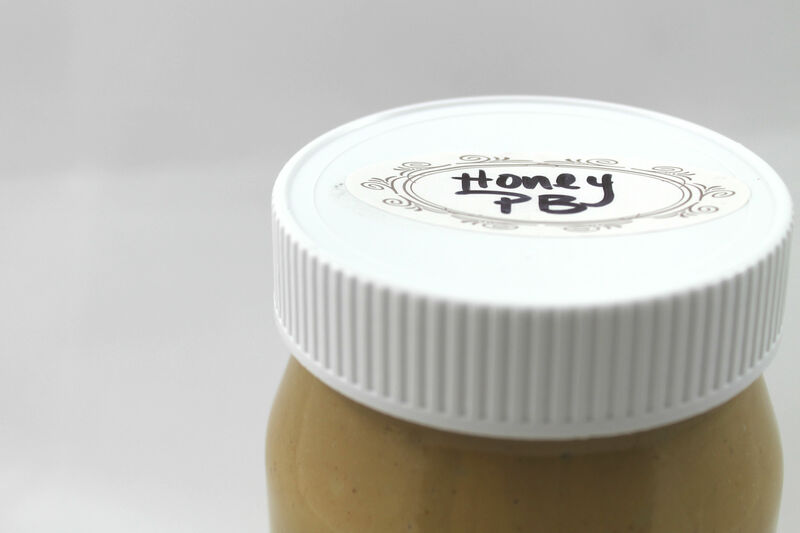 Peanut butter is a staple in most American pantries and ours is no exception. We usually have multiple varieties on hand at any given time. 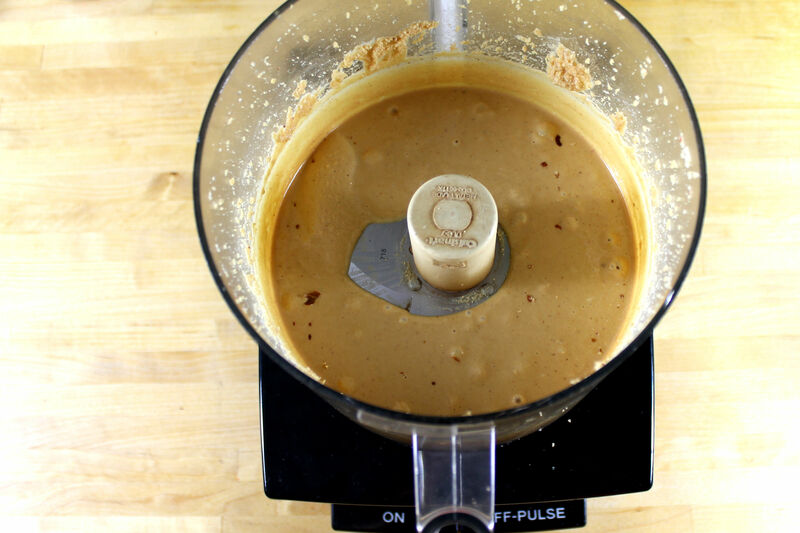 We really really love peanut butter, especially homemade. On more than one occasion, I have run out to the store to specifically get fresh ground peanut butter. Once you discover it, it is hard to go back to the jar variety on the shelf. The ingredients are simple: peanuts, honey and sea salt. You can feel good about the lack of ingredients like palm oil and added sweeteners that are found in the most popular jarred varieties. With all the ingredients on hand, this comes together in roughly five minutes. You want to use unsalted dry roasted peanuts so you can control the amount of salt that is added. Also, by purchasing dry roasted peanuts you can skip the step of roasting them yourself. Raw peanuts are not particularly common in stores and you will easily find the dry roasted variety. 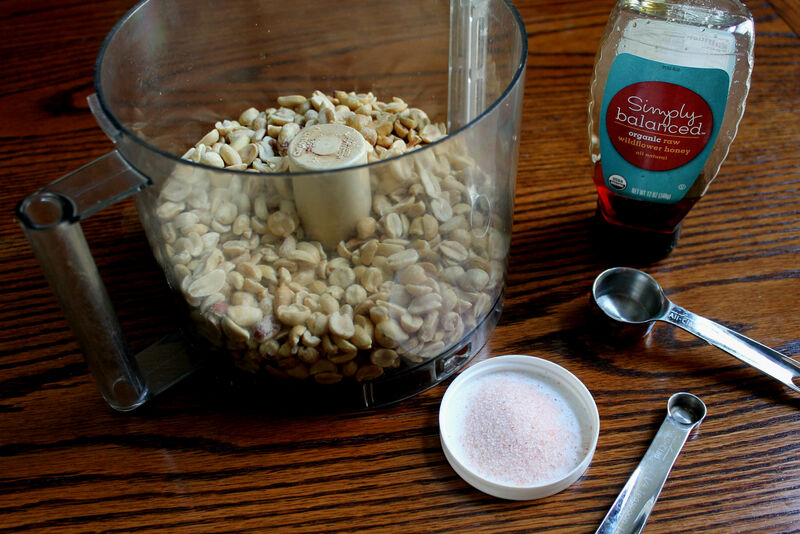 Let’s get working… Pour your unsalted dry roasted peanuts into the food processor with the standard blade. Turn food processor on and let it run for approximately 3 minutes. Come back and scrape down the bowl and around the blade. The mixture will look like fairly smooth at this point already. Continue processing the peanut butter for another 2 minutes. It will now have a silkier appearance and more uniform color. Scrape your bowl again, add the honey and sea salt. Finish up with a few pulses to incorporate the honey and salt completely. 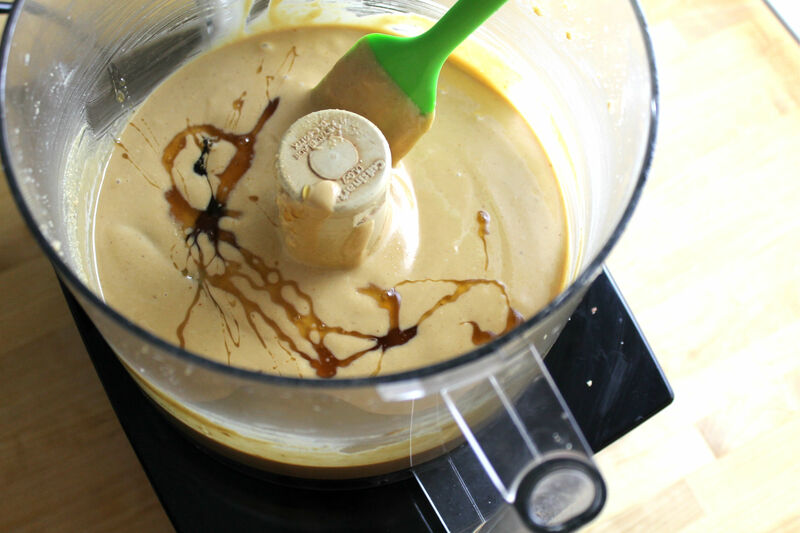 The mixture will firm up with the addition of honey and will now be the perfect spreading consistency. Transfer to a clean mason jar or container. Store at room temperature for up to a month. It will be gone before then though, I promise. 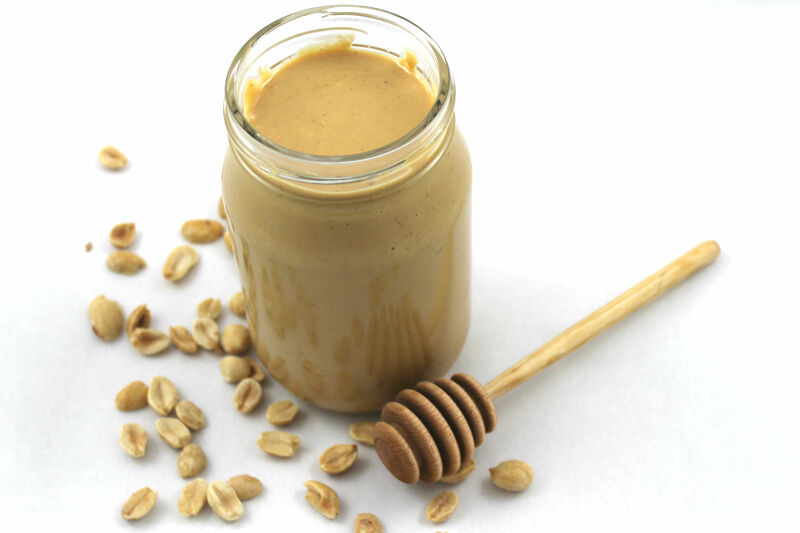 Homemade Peanut Butter with a hint of Honey. 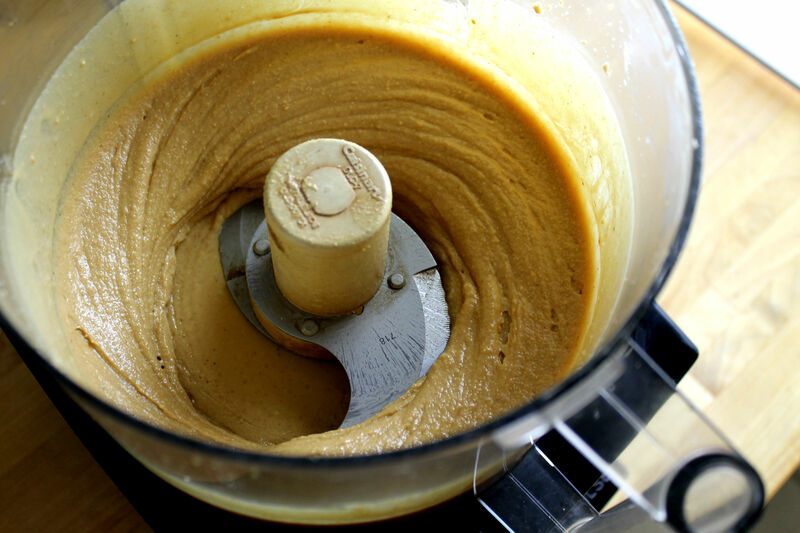 Pour peanuts into bowl of food processor. Turn on and let run for 3 minutes continuously. Turn off and scrape the bowl. Turn on once more for 2 more minutes. Turn off and scrape down the bowl again. Add the honey and salt. Pulse 3-5 times to fully incorporate. Transfer to a clean jar or container. Store at room temperature for up to a month. One Response to "Honey & Sea Salt Peanut Butter"